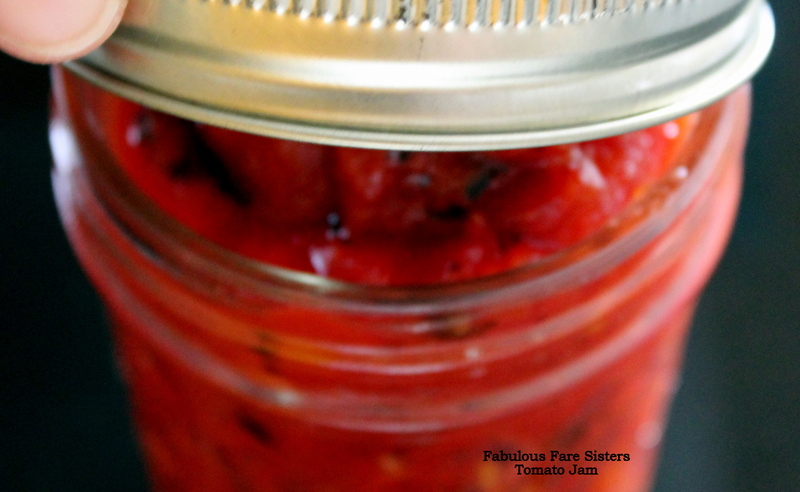 My sister in law Soraya once gave me a jar of homemade Tomato Marmalade – it was so very good! We used it as an appetizer with crackers and cream cheese…yummy! So I recently decided to try my hand at making it…but as I like things simple and quick, and I did not want to make a lot, I started with a can of Fire Roasted Tomatoes. The results were divine! We used half of this delicious jam with crackers and cream cheese and the other half I used for a recipe I’ll be sharing on Wednesday! Place the drained diced tomatoes in a saucepan and bring to a boil on medium-high heat. Add the sugar and salt and stir well. Zest and juice the lemon and add to the bubbling tomatoes. Lower the heat and simmer 30-45 minutes. Cool slightly and spoon into a jar. Refrigerate until ready to use. I’ve shared this on Foodie FriDiy, Fiesta Friday, SaucySaturdays and Sunday’s Simple Homemaker…go check it out and see some other great recipes and ideas! This looks so good – I’ll have to make it this summer!! 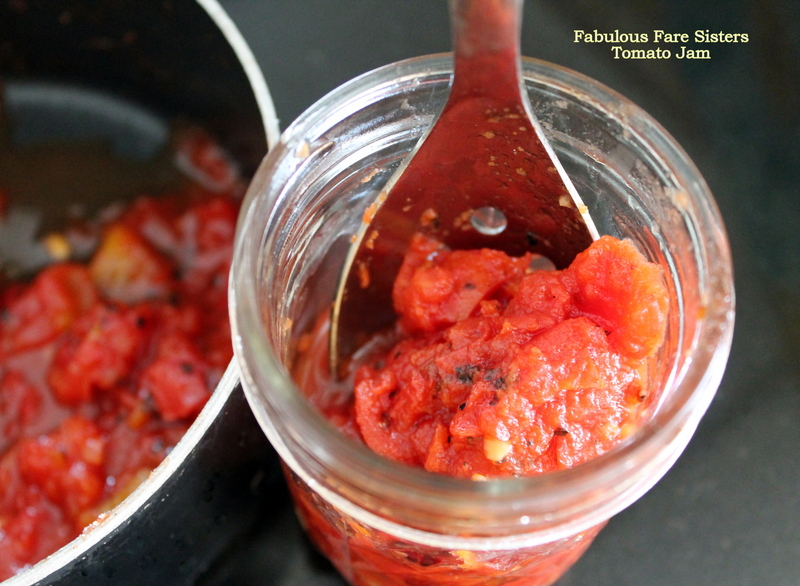 Love tomato jam – looks easy & delicious! OK, so THATS what tomato jam is, and THAT’S what you do with it!! How clever to use the fire roasted! Thanks for sharing with us on Throwback Thursday!! Yum, this looks so great!! I love tomato jams!! I need to keep this recipe for sure! Thank you for sharing with us at Throwback Thursday! Hope to see you again this week. MMmmmmm love tomato jam, can’t wait for the tomatoes of summer. Thank you so much for bringing this to FF Linda. I’ve never made Tomato Jam before, but I might have to this summer! Hi Linda – good to see its light on sugar and salt – but do you think this means it wouldn’t keep for too long? I have never heard of this before sounds very interesting and worth a try for sure! It’s good to be able to try something new. It looks nice. Sounds delish! Have never tried, but hope to! My husband liked it so much I’m going to have to make more! LOL 🙂 🙂 Have a great week Jodi! Oh I agree with you so much Linda! The tomatoes in the stores right now are completely flavorless. This sounds really great ! YUMMY! I think I may have to try this with the summer crop of tomatoes this year. Same here! We’ve had such warm weather that I keep prodding my dad to try and get his garden started early. I’ve not been to Texas yet – but am hoping to go to San Antonio sometime this year. Ever been there? If you do go to SA< you'll be about 250 miles from me. I was born and raised in the Hill Country (which includes SA). If you ever get there, I have plenty of tips for restaurants, food trucks, farmers' markets, etc etc etc.